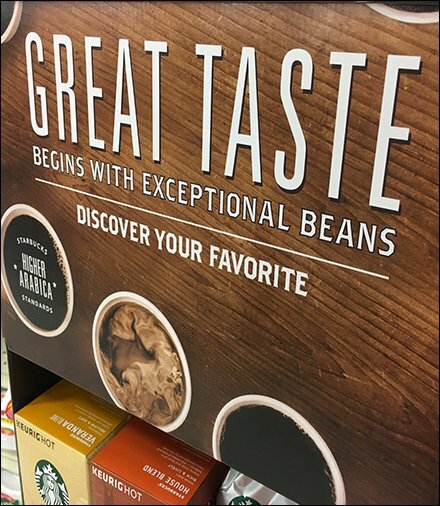 “Great taste Begins With Exceptional Beans” pitches this Starbucks Coffee Takeout Display In Grocery. Both ground bagged beans and Keurig K-cup cartridges are offered. The rich coffee-colored corrugated display stands out. The location is the almost lilly-white paper goods aisle. I did not see paper coffee cups adjacent, but do look more closely before you leave the aisle. And don’t forget this Starbucks Coffee Takeout Display In Grocery could appear anywhere in the store.